“Like many Canadians, I have a dual identity,” Rawi Hage states. Born in Beirut, his experience of nine years of the Lebanese civil war has informed his work. At age 20, he left for New York and then settled in Montreal, where he was a cabbie for many years. 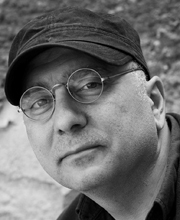 Rawi is a writer, journalist, visual artist, and curator. His artwork has been shown in galleries and museums around the world. Rawi’s debut novel, De Niro’s Game, won the IMPAC Dublin Literary Award and was a finalist for numerous prestigious national and international awards, including the Scotiabank Giller Prize and the Governor General’s Award. His second novel, Cockroach, won the Hugh MacLennan Prize for Fiction and was a finalist for the Scotiabank Giller Prize, the Governor General’s Award, and Rogers Writers’ Trust Fiction Prize. Carnival won the Hugh MacLennan Prize and the Quebec Writers’ Federation Award. His work has been translated into 30 languages. His new novel, Beirut Hellfire Society, follows Pavlov, the son of an undertaker, who, after his father’s death, is approached by the mysterious Hellfire Society–an anti-religious sect that arranges secret burial for the outcast and abandoned. The book is a brilliant, urgent meditation on what it is to live through war.